Sapphire 830 has 105 stitches, 3 alphabets, 10 permanent memories, and a large graphic display. Husqvarna Viking Sapphire 830 Sewing Machine. Innovations like the Exclusive Sewing Advisor© and the Exclusive Sensor System are top-of-the-line Husqvarna Viking features. Now, the new Sapphire sewing machines bring you the ease and convenience of these timesaving features at a price you can’t resist! You will also experience all the joy of sewing with the longest Free Arm in the industry and the largest Extended Sewing Surface. Dual Lights illuminate the needle and sewing surface to make sewing easy and eliminate eye strain. Plus the large GraphicDisplay, easy Touch Panel, permanent memories with the My Stitches menu, wonderful stitches and lettering make sewing a true pleasure. Husqvarna Viking Sapphire 830 Key Features. The Exclusive Sensor System automatically raises and lowers the presser foot to four positions. The Sensor Foot Extra Lift gives you maximum space under the foot. With Sensor Foot Pivot the machine senses the fabric thickness when stopping with the needle down to raise the foot to the float position for instant pivoting. Plus, the Sensor Foot Pressure automatically senses any fabric thickness and adjusts for perfectly even feeding. Greets you with open arms! Husqvarna Viking Sapphire features the longest Free Arm in the industry with large Extended Sewing Surface. 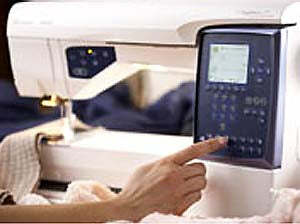 You have more sewing and fabric space than ever before on a home sewing machine. The area from the machine side to the needle measures 250 mm (10 inches). Sewing small projects and circular techniques is easy because the needle is close to the end of the free arm. Guides your path to self-expression! The Exclusive Sewing Advisor™ feature sets the best stitch, stitch width, stitch length, and sewing speed. Simply enter the type of the fabric you are sewing and the technique you want to sew. 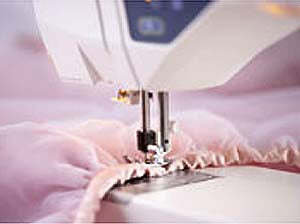 Immediately the best stitch and settings are displayed on the large GraphicDisplay with the recommended presser foot, thread tension, and needle size and type. 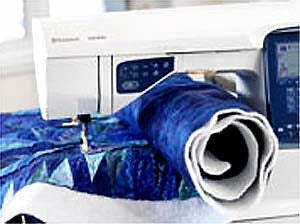 The Dual Lights on Husqvarna Viking Sapphire illuminate the needle and extended sewing surface to make sewing easy. The lights eliminate eye strain, especially when sewing fine details. A clear view to perfection! Simply touch the selection buttons on the easy Touch Panel or step through stitches with the Navigator Arrows. Everything you need to know to sew is on the illuminated large GraphicDisplay. See the stitch, in its actual size, and any adjustments before you sew. Husqvarna Viking Sapphire 830 Features. Husqvarna Viking Sapphire 830 Information. Comparison Guide (870 Quilt, 850, 830).